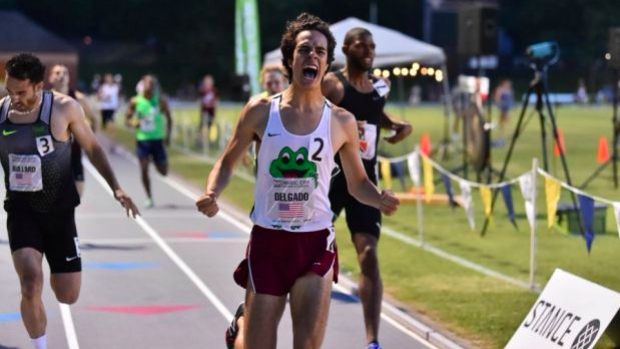 In 2016 Ian Delgado moved from Texas to Green Hope High School, where he had immediate success on the track. That same year Delgado watched the states top 800m runner and teammate Jayquan Williams clock 1:50.50 for their school record. With Delgado being just a sophomore, the standard had been set for what he needed to accomplish in his final two years of high school. Delgado was set to face off against a professional/collegiate field at the Music City Distance Carnival on Saturday night in Nashville, Tennessee. The race had a rabbit set to go through 800 in 52 seconds, and the pacer was right on the money. Delgado was out hard as was the rest of the field. He sat in 3rd/4th place through the 200 sitting in great position. He kept his position through 400 and crossed the line in 53.35 right up at the front of the field in great contention to win. The Green Hope senior started to swing wide on the backstretch and pulled into the front of the field just past the 200m mark. He went through 600 in around 1:20 unofficially. Delgado was rolling down the home stretch trying to hold off a field of strong finishers, but the pros could not beat the high school star. Delgado crossed the line in 1:49.71, closing in 56.36 taking an exciting win. The time is currently good for NC#1, US#3 and NC#3 All-Time, also breaking the Green Hope School Record. This puts Delgado in elite company as he is now the fifth North Carolina High Schooler to break 1:50 in the 800m. Delgado will run relays chasing records at New Balance Outdoor Nationals in two weeks, and also received an invite to Brooks PR where he'll chase yet another 800m PR. He could challenge the state record of 1:48.01 held by John Crossley.